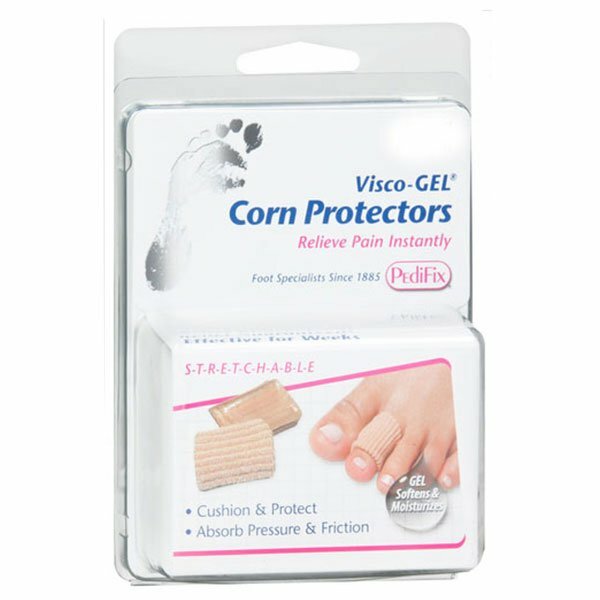 PediFix Visco-GEL Corn Protectors Large 2/pk is a specialty foot care product by the makers of Pedifix. Pedifix has been a trusted name in foot health products for more than 100 years. The Visco-GEL Corn Protectors are designed with a proprietary gel that absorbs pressure and friction as well as soothes and softens corns. The Visco-GEL releases mineral oil enriched with vitamin E to moisturize the skin. The Soft'N Stretch Fabric Sleeve keeps Gel in position without adhesives. Provides pain relief to painful toes. Contains 2 Visco-Gel Corn Protectors - Large. Directions: Slip over toe and position gel pad over corn (Gel pad is only one side of the sleeve). Test for comfortable fit. Remove and trim length, if needed. Pull hosiery on carefully and re-adjust as necessary. Washing Instructions: Hand wash. Air dry completely before reuse. Sprinkle with talcum powder if gel becomes tacky. Warning: If you have diabetes or poor circulation, consult your physician before using. If numbness, discoloration, irritation or additional toe pain occurs, discontinue use immediately. Do not use over broken or inflamed skin. If symptoms persist, visit a foot specialist.